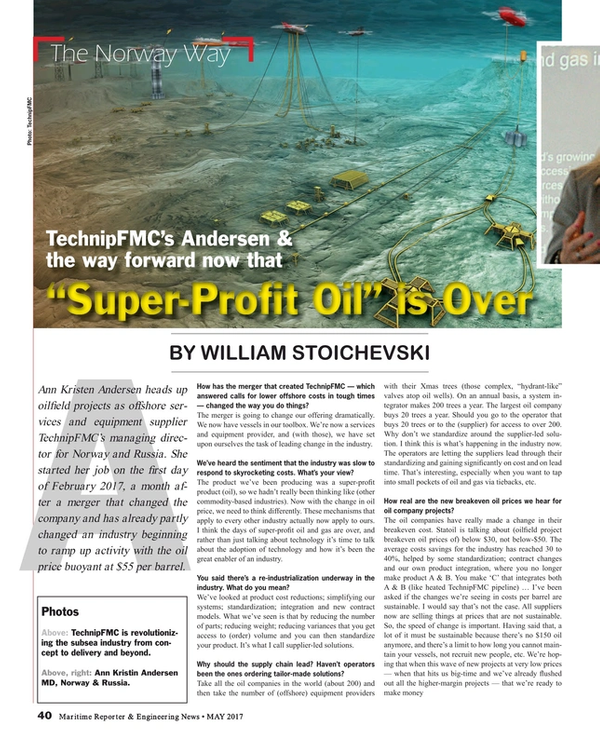 TechnipFMC’s Andersen discusses the way forward now that “super-profit oil” is over. Ann Kristen Andersen heads up oilfield projects as offshore services and equipment supplier TechnipFMC’s managing director for Norway and Russia. She started her job on the first day of February 2017, a month after a merger that changed the company and has already partly changed an industry beginning to ramp up activity with the oil price buoyant at $55 per barrel. How has the merger that created TechnipFMC — which answered calls for lower offshore costs in tough times — changed the way you do things? The merger is going to change our offering dramatically. We now have vessels in our toolbox. We’re now a services and equipment provider, and (with those), we have set upon ourselves the task of leading change in the industry. We’ve heard the sentiment that the industry was slow to respond to skyrocketing costs. What’s your view? The product we’ve been producing was a super-profit product (oil), so we hadn’t really been thinking like (other commodity-based industries). Now with the change in oil price, we need to think differently. These mechanisms that apply to every other industry actually now apply to ours. I think the days of super-profit oil and gas are over, and rather than just talking about technology it’s time to talk about the adoption of technology and how it’s been the great enabler of an industry. You said there’s a re-industrialization underway in the industry. What do you mean? We’ve looked at product cost reductions; simplifying our systems; standardization; integration and new contract models. What we’ve seen is that by reducing the number of parts; reducing weight; reducing variances that you get access to (order) volume and you can then standardize your product. It’s what I call supplier-led solutions. Why should the supply chain lead? Haven’t operators been the ones ordering tailor-made solutions? Take all the oil companies in the world (about 200) and then take the number of (offshore) equipment providers with their Xmas trees (those complex, “hydrant-like” valves atop oil wells). On an annual basis, a system integrator makes 200 trees a year. The largest oil company buys 20 trees a year. Should you go to the operator that buys 20 trees or to the (supplier) for access to over 200. Why don’t we standardize around the supplier-led solution. I think this is what’s happening in the industry now. The operators are letting the suppliers lead through their standardizing and gaining significantly on cost and on lead time. That’s interesting, especially when you want to tap into small pockets of oil and gas via tiebacks, etc. How real are the new breakeven oil prices we hear for oil company projects? The oil price shifted pretty fast. What sorts of effects has that had on contractor-operator order deliberations? (Someone says) try to commit to a price that we can actually realize. (At the newly okayed 31-year-old discovery) Trestakk, we ended up having an integrated EPCI solution, subsea, all the way back to existing infrastructure. It was a different contract model (based on saying). It’ll get to be a project if you hold to this price. When the oil price was very high, there was a rush to get projects out there (and the oil companies paid). Now, perhaps, projects have been examined a little too much. What’s the pace of recovery right now do you think. Are investment decisions being made in great enough volume? How many might be made in the coming months? I won’t say the number of (final investment decisions), but it’s a multiplier of 10 (over last year’s project count). It’s amazing the activity level and oil company’s wanting to launch projects these days. The trick is to try and do the right one, and we’re happy to work with our customers on this. There’s a minimum 30% cost savings if you do a (front-end-engineering, or FEED and integrated engineering procurement construction and installation, or iEPCI). FMC is now winning the industry’s first iEPCI projects, and Statoil has chosen to do an iEPCI with the Trestakk field. We now have lots of these coming our way. The years 2017, 2018 and 2019 were supposed to be when — first subsea services and then subsea equipment vendors — could start to see business as usual. Now you’re both types of company. Which segment will find its way out of the downturn first? What you used to do is you stripped everything down, and you built it up again. It was a very expensive refurbishment. Now we’re doing a lot more condition-based (maintenance) and we offer lots more digital services to support decision-making about what we do with your asset. So, yes, for us volume has significantly dropped but it still continues to grow. So it’s not like you’re selling these (services only). Instead, what you’re selling is sustainable (field maintenance contracts). We see a lot of interest in the aftermarket, just at a lower level than it used to be.